It’s a strange thing, bereavement. You may think “you have got over it”. ”Moved on”. You would have thought that would be “good thinking“. Those around you may think how “well you are doing” and “making the best of life”. Then something quite insignificant happens and you realise that it’s not quite as simple as that. Such was Bobby’s experience a few days ago. Once associated with the high living and self indulgence of rich ne’er-do-wells and the like in previous centuries. Gout is no fun at all. Particularly in Laurel Cottage. Once the world centre of red wine drinking and now alcohol free. Ha ha ha. Ouchhhh. But back to the rain falling down relentlessly. It seemed to Bobby the perfect afternoon for a trip to the pictures (cinema, flicks etc). Joining a sea of grey hair, mostly older than his own, he entered the brave world of the early afternoon showing of “The Guernsey Literary and Potato Peel Society”. The Guernsey Literary & Potato Peel Pie Society film poster. He loved the film, but it brought back profound feelings of sadness. Not just for recent times, but for long ago. Back in his car, with the rain pit pattering on the roof, he had to fight back the tears. Why? When he was getting on so well after nearly three years on his own. It’s simple. In that moment, he badly needed the emotional connection that maybe only true love can provide. And some good thinking. Someone special to share the daftness and understand an old bloke in tears. So he drove to Abinger Roughs and sat in the rain on the bench. And then consigned this little act of self indulgence to experience and headed for the chippy. Superdish chippy. Closed on a Sunday. Fish and chips in his favourite chippy, with fish shop friends, soon restored him to cheerful Bobby. Reading the last few pages of “Common Ground, by Rob Cowen” for an hour, with no one bothering him to go. And then resolving to share it with you. The Common Ground, by Rob Cowen. Much as Bobby loves planes and writing about them, he has little interest in actual flying. Apart, that is, from one or two very special occasions in proper aircraft. More later. In 1986, he finally found himself flying to Guernsey. It should have been really exciting, but GAD (www.mindfullybertie.org.uk/gad-generalised-anxiety-disorder) had intruded on his well being during the weeks preceding and taken the edge of the whole holiday. Why? Who knows. Nowadays he would know, but back then sympathy was in short supply and he had to try to “pull himself together”. It was supposed to be a holiday. Flying over southern England and across the sea to Guernsey, it was immediately apparent that the Island was not very green. Lots of greenhouses and the like. The hotel, La Favorita, was fine. Run by the Wood family, who then owned the nearby island of Herm. Fine, that is, until the East Grinstead Freemasons turned up to join their Guernsey counterparts and consign ordinary guests to the side dining room. For this was the brotherhood. One day, walking along the coast path (asphalted), they had a very strange encounter. A couple walking in the opposite direction. He on crutches. Recovering, they said, from a broken leg. Walking on they heard a loud crack. A women shouting . Rushing back, they found the couple with him lying on the ground. He had broken his other leg! Bobby ran the coast path to a café and help was soon there in the form of a coastal rescue team. He even went to see him in hospital. Talking of hospitals, you could go round the German wartime hospital built on Guernsey during the occupation by slave workers. Many of whom died at the hands of their captors and hard work. You probably still can. That, and considerable concrete evidence of the wartime years, still defiles the landscape of the island. Don’t forget that this is Bobby’s rather jaundiced view of a beautiful island, seen through the eyes of GAD. Always looking for negatives to justify your own discontent with your condition, and not always with good thinking. They went close by beautiful Herm. A paradise island, with serious claims to peace and quiet. He bought a book, which is remarkably reminiscent of the film in that the Woods bought the island damaged and derelict following the war years. Herm, Our Island Home, by Jenny Wood. And they went to Sark. The island of no motor vehicles. Just horse drawn carriages and, for them, bikes. And tractors… Lots of them. Motor vehicle free it may well be, but tractors are tractors and don’t count. And then there was that weird television drama starring Derek Jacobi. “Mr Pye.” Filmed on Sark. Mr Pye wanted to teach goodness and inadvertently grew a pair of wings as a result. In an effort to reverse the situation by being nasty, he grew a pair of horns instead. Walking across the causeway to Little Sark, you couldn’t help remembering Derek Jacobi flying off. Or note that this causeway and narrow road was, ironically, built by German prisoners of war under the direction of the British army. Undoubtedly in better working conditions than the slave workers on Guernsey. Tomatoes, for which Guernsey had become famous, had given way to mail order flowers and a lot of derelict greenhouses. Back in 1986 that is. They flew off with armfuls of flowers. Nearing Gatwick, he saw the green fields of southern England that he had missed. Most notably, for a keen photographer, he had taken just twenty pictures. So this is not condemnation of a beautiful island, but how mental illness can distort the truth. Back home, he sank back into the anxiety he had fought so hard to resist. For weeks. Leaving Guernsey a rather sad memory, until he went to the pictures 32 years later and saw the love people have for this and the other Channel Islands. But he won’t go back. This simple little picture on Sark belies the truth. A vivid memory of wishing he was the same as “everybody” else. Sitting on holiday, in a beautiful place, surrounded by happy smiling people enjoying life on holiday in the sunshine, while he couldn’t be like them. Or that was how he felt then. And that is the paradox. He didn’t understand what later became known as GAD. Nor did the family and friends. Nor did his doctor. Thankfully, those days of loneliness for him, and others struggling with mental problems, are finally receding. There will always be mental problems, but nowadays there is a lot more understanding. Just that understanding on its own reduces the impact and the illness itself. Good Heavens to Guernsey and Brooklands. The Vickers Viscount was Britain’s most successful airliner. Built in the 1950s, it was in its final years of service. With those distinctive whistling Rolls Royce Dart turboprop engines, it dominated Bobby’s plane-spotting schooldays living in North Cheam. And here he was actually taking his first flight on one to Guernsey. 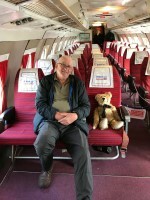 Thirty two years later, he and I sat in Brooklands Museum’s Viscount. Marvelling at those large windows, far bigger than modern jets. And then in putting together this story discovered that the aircraft was the same one. The trip to Guernsey preceded Pembrokeshire. Looking back, he has been to all the Channel Islands, including Jersey but excluding Alderney. Friend Rob recommends the latter. So did John Arlott, the cricket commentator, who lived there. These are essentially holiday islands now. Places with their own residential communities. From his Skomer days, Bobby has friends like Dave. True adventurers, who love uninhabited wildlife islands. In writing this blog, it is clear that Bobby’s love of islands falls somewhere in between. Not the true adventurer, but not the tourist either. “Dream Island” (www.mindfullybertie.org.uk/dream-island) actually where he lands again in August. Lighting a Candle to Diddley on a wet day.